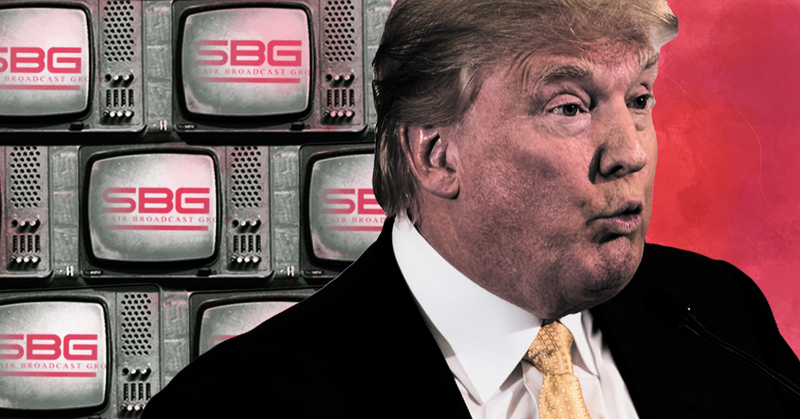 According to Sinclair Broadcasting Group, it's doing a service to its viewers by requiring the many local TV news stations it owns to air unabashedly pro-Trump propaganda on a regular basis. The local TV news giant has been pushing a right-wing slant on local television stations across the country for years. Owned by the Smiths, a family of longtime Republican donors who have all the ambition of News Corp.’s Rupert Murdoch but a much lower profile, Sinclair has mostly flown under the radar. But following the election of President Donald Trump, the network has begun adopting the playbook Roger Ailes used to turn Fox News into a conservative media goliath. Over the last few months, Sinclair has been requiring its stations to run more commentaries from pro-Trump personalities and expanding its reach to greater numbers of unassuming viewers in new local media markets. Now it's defending these clear moves to mimic the aspiring state media over at Fox with warped, brainwash-y logic: The conservative propaganda it pushes on its viewers is necessary because the rest of the media is biased. "What we find most troubling in the reporting about our company, by major media outlets (like the New York Times and Washington Post), is the omission of key facts in their stories,” Livingston wrote. "Such omissions suggest the existence of either journalistic incompetency or editorial bias. We do not believe these journalists are incompetent, so we are left to conclude that they are biased. Months after hiring former Trump aide Boris Epshteyn as its chief political analyst, Sinclair announced it would be increasing the number of times per week that Epshteyn’s right-wing commentary segment, “Bottom Line with Boris,” must air on its local stations. Media critic David Zurawik has described these segments as “as close to classic propaganda as I think I have seen” over his 30-year career. “Bottom Line with Boris” is one of three regular Sinclair segments considered to be “must run” content, meaning that all Sinclair stations are required to air them. The other two segments are “Behind the Headlines” with conservative commentator Mark Hyman and a fearmongering “terrorism alert desk.” The practice has raised concerns from experts and employees at local Sinclair stations. Sinclair is currently seeking to acquire Tribune Media for $3.9 billion, a move that would make Sinclair the largest provider of local television news in the country. The potential acquisition, by the way, is possible only because of a Trump administration move to roll back Obama-era consumer regulations. And at its very, very worst, Sinclair is sneaking the very lowest in fringe, far-right commentary into the living rooms of unsuspecting Americans who did not sign up for it. The most devastating example is this must-run segment from April, in which Mark Hyman alludes to the heinous far-right conspiracy theory about the death of DNC staffer Seth Rich. The Hyman and Epshteyn segments are doing the dirty work of pushing Sinclair’s openly pro-Trump agenda and anti-media propaganda efforts to unknowing local television viewers on the regular. Thanks to the deregulatory efforts of President Donald Trump’s Federal Communications Committee, the right-wing Sinclair Broadcast Group announced today that it will purchase dozens of televisions stations across the country, allowing the company to spread its conservative programming to new markets and consolidate the ownership of broadcast stations in fewer hands. The conservative Sinclair Broadcast Group’s announcement that it hired former White House aide Boris Epshteyn as its chief political analyst suggests a move to deepen its ties with President Donald Trump’s administration. During the election Sinclair struck a deal with the Trump campaign for better news coverage and then gave the president a softball question during his second press conference. As Politico reported at the time, Trump's son-in-law and senior adviser Jared Kushner said in December that Sinclair “struck a deal … during the campaign to try and secure better media coverage” for Trump in exchange for “more access to Trump and the campaign.” In August 2016, Trump debuted a new media strategy which included sitting for an interview with Sinclair..
During his second press conference as president, Trump called on only two American reporters to ask questions, one of whom was from a Sinclair station (the other one was also from a conservative media outlet). The question was a softball that avoided the main story of the day about former National Security Advisor Michael Flynn’s possible criminal violation of the Logan Act. This led to criticism from other journalists, including a Fox News reporter. Sinclair Broadcast Group, Inc. (Nasdaq: SBGI) is pleased to announce that Boris Epshteyn, an accomplished commentator and strategist, has joined the company as chief political analyst and will provide analysis and insight on major political stories. "I am honored and grateful to be joining the distinguished and extremely talented team at Sinclair Broadcast Group," commented Mr. Epshteyn. "I greatly admire Sinclair's mission to provide thoughtful impactful reporting throughout the country. I look forward to contributing my voice to the ongoing dialogue with the American people." Mr. Epshteyn most recently served as Special Assistant to The President and Assistant Communications Director for Surrogate Operations for the Executive Office of President Trump. Mr. Epshteyn managed the surrogate operation of the White House and Administration as well as appeared as an on-air spokesman for the Administration. Prior to joining The White House, Mr. Epshteyn served as Communications Director for the 58th Presidential Inaugural Committee. Mr. Epshteyn was a surrogate and Senior Advisor to the Trump Campaign, where he managed messaging.